Welcome our new monthly guest writer Kathy Buckworth and her Funny Mummy column. Kathy helps Moms everywhere laugh and realize that balance is just something you need to do while putting on your peep-toe heels. And holding that glass of Chardonnay. 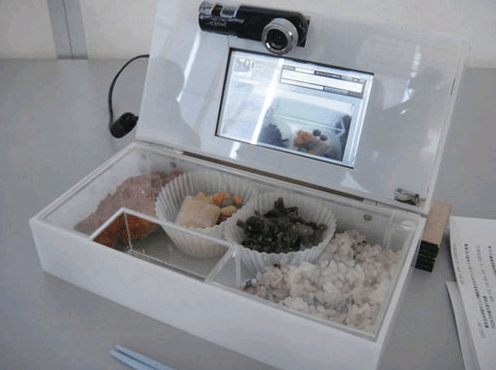 The Japanese have introduced a technological “advance” with the invention of the Lunchbox Communicator, a modified “Bento Box” which includes a video camera and screen, embedded in the box’s lid. The idea here is that the child can watch Mom preparing his/her lunch, just before digging in, and Mom can in return watch Junior eating it. As riveting as video footage of lunch making can be – quite surprised there isn’t a reality show called “Extreme Lunch Boxes” – and as appealing as it is to watch a child eat lunch, it begs the question: Why? Why? Why? Making the decision as to what you will eat out of your school lunch is a major part of learning and growing as a child. Do you go for the apple Mom packed, or try to trade it for your best friend’s cupcake? Is that homemade chocolate chip cookie really worth two fruit roll ups? It’s sort of like a food version of “Let’s Make a Deal”, and the bartering and bargaining learned here can build a foundation for negotiating skills most kids will require later on in life (particularly if they become parents themselves). And with most schools now having supervisors watching for kids throwing out healthy food, trying to sneak it into a garbage can is a risky option compared to the good old trade. But with every move being monitored by the video camera’s watchful eye, these poor children will likely be forced to eat what their Mama gave ‘em…and where’s the fun in that? On the other side of the lens, I’m not sure why there’s thinking that kids would want to watch their parents prepare their lunches. Kids don’t want to watch their mothers do anything; particularly something as pedestrian as providing them with a basic life necessity. Do the manufacturers really think that the kids will appreciate the effort that Mom (or Dad) has put into the preparation of this meal? If anything, they’re more likely to be turned off when they realize that there are “raw” ingredients that go into making a sandwich, salad, or cooked entrée. “There’s cheese in my macaroni? I never knew that. You know I hate cheese Mom.” No, I think this new innovation has disaster written all over it. I don’t know about you, but watching my children eat breakfast and dinner at home is enough “food bonding” time for me. Also, I’m not entirely convinced my children wouldn’t capture an inappropriate body part on the camera, just for my viewing pleasure. I mean, what’s next? Do we want to have two way video cameras on our children for other moments during their school day? Not sure I need to see how uncoordinated they are at gym, or that the pencil they use for homework is also an effective scratching implement for places that scratching shouldn’t be done in public. Let’s leave some things in the realm of the unknown, and unwatched, shall we? Guest post by Kathy Buckworth. Kathy Buckworth is an award winning humor writer, and feature writer for Sympatico.ca in their parenting, travel, and auto sites. She is the author of five books, including “The BlackBerry Diaries: Adventures in Modern Motherhood” and her latest, “Shut Up and Eat: Tales of Chicken, Children & Chardonnay”. Get Kathy Buckworth’s books at Amazon.com and learn more about Kathy at www.kathybuckworth.com and connect with her on Twitter at @kathybuckworth. I’m a teacher and I don’t allow sharing food at lunch and snack. How am I supposed to know who is going to go into anaphylactic shock? I mean. I have other worries. Some moms would be disappointed to watch their kid dump the whole shebang though, no doubt. C’est la vie. I like the idea of the bento box but not the camera. That’s odd.